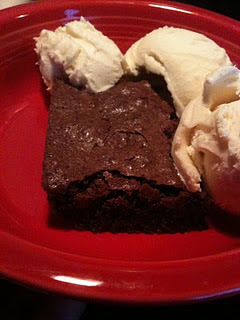 You can NEVER go wrong with brownies so I just had to make these! I must first start off by saying, growing up the brownies my mom made were not gooey, more on the cake-y side but always had a thick layer of some sort of chocolate frosting, not like a frosting you use for a cake, but a firmer version a tad of granieness from the sugar….OH I dunno but they BY FAR are my most FAVORITE brownies EVER!!! So these are in at second place for me!!! Center a rack in the oven and preheat the oven to 350º F. Put a 9 inch square baking pan on a baking sheet. Whisk flour and salt together. Set a heat proof bowl over a saucepan of gently simmering water, put the butter and chocolate in. Stir frequently until the ingredients are just melted-you don’t want them to get so hot that the butter separates. Add 1 c. sugar and whisk gently just to incorporate it, then remove the bowl from the pan of water. Stir in the vanilla and transfer to a large bowl. Put the remaining cup of sugar into the bowl of a stand mixer or a medium bowl and whisking, stir in the eggs. Switch to a rubber spatula and little by little add half of the sugar-egg mixture to the warm chocolate, stirring very gently without stopping-you don’t want the heat of the chocolate to cook the eggs. With the whisk attachment or with a hand mixer, beat the reaming sugar and eggs on medium-high for about 3 minutes, or until they double in volume. Using a spatula and a light touch, fold the whipped eggs into the chocolate, stopping just short of blending them in completely. Sprinkle the dry ingredients over the batter and delicately fold them in, working only until they disappear. Scrape the batter into the pan and smooth the top with the spatula. Bake for 25-28 minutes, or until the top looks dry. Poke a thin knife intot he center and take a peek: The brownies should be only just set and still pretty gooey. The brownies are fragile and best cut in the pan. Cut eighteen 1½ x 3 inch bars. For myself they were of course served best with vanilla ice cream, the brownie was slightly heated up before the ice cream piled in the bowl. Man were they good!!!! Categories: Baking, Brownies | Tags: brownies, chocolate, dessert | Permalink.